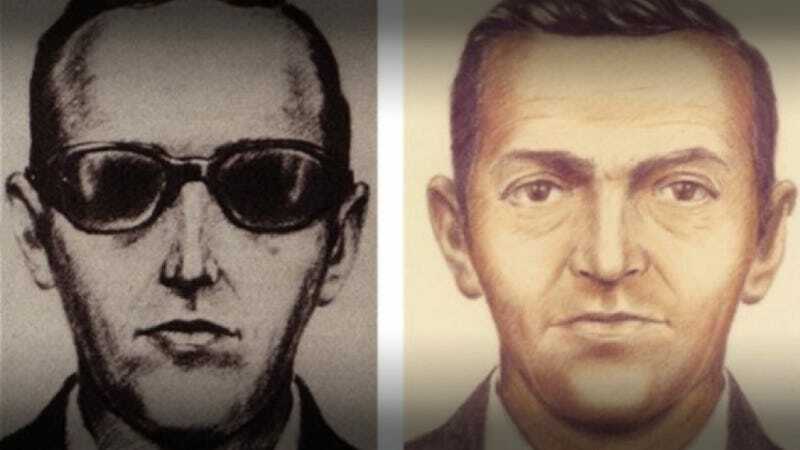 The new evidence in the hunt for "DB Cooper"
After hijacking an airplane and extorting $200,000 from the FBI, DB Cooper calmly made a daring escape via parachute. Forty years later, new evidence suggests law enforcement may finally be hot on the trail of America's most elusive fugitive. But what is this new evidence? On the night before Thanksgiving of 1971, a man who called himself Dan Cooper (a reporter working for one of the wire services misheard the name of the hijacker, and ever since then he has been referred to as DB Cooper, rather than Dan) wearing a suit and raincoat, walked up to the Northwest Orient desk at Portland's airport and spent $20 on a one-way ticket to Seattle. I HAVE A BOMB IN MY BRIEFCASE. I WILL USE IT IF NECESSARY. I WANT YOU TO SIT NEXT TO ME. YOU ARE BEING HIJACKED. What happened next would give Cooper a place in the pantheon of American folk heroes. Cooper asked the stewardess to relay the following request to the plane's captain: he wanted $200,000 and four parachutes, and in return, he'd allow 36 people to leave the aircraft when the plane landed in Seattle. The FBI, quickly contacted by ground control, organized the swap, and when the plane was sky-bound again, with just the pilot, co-pilot, one stewardess and Cooper on board. The hijacker's instructions were to head for Mexico, maintaining an altitude under 10,000 feet. Then, somewhere over the lower Cascade mountains, 25 miles north west of Portland, Cooper released the plane's aft stairs, stepped out, and, with one of the parachutes strapped to his besuited back, jumped into the stormy, cold November night and was never seen or heard from again. By the time military helicopters were scrambled, on November 24th 1971, to search the land north of Portland for a six-foot-tall white guy weighing 170 to 175 pounds, "DB" Cooper was long gone — presumably either dead or packing away his parachute and trudging through mud and rain to make his escape. Over the past 40 years since that cold night, there have been more than 1,000 Cooper suspects, several deathbed confessions, a film (starring Robert Duvall), and well over a dozen books. As one person told legendary Cooper tracker Alex Hannaford, Cooper is the "Bigfoot of the Pacific Northwest." It makes sense why Cooper holds such an important place in American folklore — the hijacking is the only one in U.S. history to go unsolved and offers, for many, an opportunity to see one lone man thumb their nose at "the" man — the government. Also, there's been tantalizing little in the way of clues. The first major "break" in the case came in February of 1980 when, nine years after the Cooper skyjacking, an eight-year-old boy found three packets of the Cooper ransom money on a local beach, still bundled up in rubber bands. It was just under $6,000 — the bulk of the $200,000 was still missing — but it was enough to put Cooper back in the papers. "As for suspects, there have been more than 1,000 over the past four decades. Military veteran William Gossett had had parachute training and was widely known to be obsessed with the Cooper hijacking. Towards the end of his life he reportedly told his sons and a retired judge that he was the hijacker. According to attorney and Cooper sleuth Galen Cook, Gossett also owned a safety deposit box which contained $200,000 and that he ended his days on the run in Utah. The FBI, however, says there is no firm evidence implicating Gossett at all. Another suspect is Kenny Christiansen, a former paratrooper who died in 1994. Eight years ago, after watching a documentary on the Cooper case on television, Christiansen's brother, Lyle, became convinced his elder sibling was Cooper. His efforts to persuade the FBI, however, proved futile." But that's not to say the FBI isn't still pursuing Cooper. In fact, Ayn Dietrich, a former analyst with the bureau, is still now tasked with handling inquiries about the Cooper case. "Being an open but not active case, we respond to every report or lead. Our case agent will check them out and determine whether they're credible. We're not out there combing for more evidence but we've kept it open in the belief that there could be something out there. The money has surfaced before and perhaps more will surface." "You're the first to know this, but we do actually have a new suspect we're looking at. And it comes from a credible lead who came to our attention recently via a law enforcement colleague." I'm stunned. Dietrich says she can't tell me much more, but like all the Cooper sleuths I've met over the past few days, I too have become a little obsessed with the case. "The credible lead is somebody whose possible connection to the hijacker is strong," she says. "And the suspect is not a name that's come up before." Dietrich says agents have sent an item that belongs to him for testing at the forensics lab in Quantico, Virginia. "We're hoping there are fingerprints they can take off of it," she says. "It would be a significant lead. And this is looking like our most promising one to date." It's a pending investigation, and she can't tell me any more. I push her to see if she can say whether the suspect is still alive. "Generally, the large majority of subjects we look into now are already deceased based on the timing of this," she says. I follow up with Dietrich a week after my visit, but she says it could be some time before the FBI gets the results back. So are we now close to finally having a real suspect in the decades-old case? Maybe. Dietrich cautions that the FBI is not on the verge of a "big break," but is carrying out "due diligence" on the new information. But could we finally be closer to finding out the real identity of the enigmatic character known as DB Cooper? I hope so.